Do you need more extensive support and advice? If you are no longer 100% mobile and have to leave your familiar home, moving is a particularly heavy load. 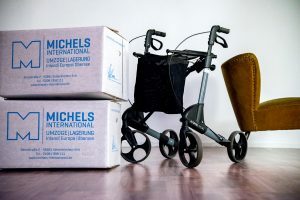 With Michels International, you can look forward to your relocation calmly and serenely. Because when moving seniors, we set even higher standards for agreement and coordination, preparation and implementation. We spend even more time with you, address your wishes and worries with sensitivity and keep any moving stress far away from you. After detailed consulting and planning on site, you decide what you want to take, what ought to be disposed of and what we should store for you. At the new location, we build everything for you as discussed beforehand, put things into closets and cabinets, connect all electrical appliances, so you’ll quickly feel “at home” again. We’ll gladly support you with liquidation and renovation work, visits to the authorities, etc. Don’t hesitate to contact us.